Note: In January 2002, a month after setting up Fathers4Justice, founder Matt O’Connor gave his first interview to the Evening Standard and explained why he has started the organisation. Published here for the first time online by Fathers4Justice. Judges are calling on Ministers to act over fathers who are denied access. Here, one dad, Matthew O’Connor, tells of his legal fight. Many times over the past three years I have been so low, I’ve kept hoping I would wake up from a bad dream. When my wife, Sophie, and I divorced, she got custody of our sons Daniel, now six, and Alexander, five, – and there the nightmare started. I was a loving father, who had never done anything but protect and cherish my children, but I was told by a judge that four hours a week was “adequate contact” between us. “I never chose to be divorced from them, but I was treated like a criminal”: Matthew O’Connor, 35, with Daniel, left, and Alexander. Just months before I had been fit to bathe and put my little boys to bed every night, but now I was being treated as a pariah. I was to become what I’d dreaded since the day my wife told me she wanted a divorce – a “McDad”: one of those pitiful fathers you see in a McDonald’s on a Saturday afternoon, desperately trying to make the most of a few hours of contact with his children. Sophie and I married in 1994, six months after we met in a bar. I thought it would last forever – I loved everything about her, especially her Spanish looks and sense of humour. Our happiness was complete when Daniel was born in April 1996. Alexander followed in January 1998. Life was busy because I’d just set up my own design and marketing company – a long-held ambition of mine. But trying to juggle the new business with two young children was hard. Sophie went back to work as a teacher four months after Alexander was born, and increasingly we had less time together. The financial pressures were difficult and, combined with sleepless nights. Sophie and I were stressed and started to argue. Soon our relationship was falling apart. I was working 14 hours a day in the City and often I wouldn’t get home to Bromley until past 8pm. In January 2000, Sophie filed for divorce on the grounds of unreasonable behaviour. She told me shortly after New Year. It came as a real shock. I’d though we would work through the hard times. I wanted to make a go of it but she’d made her mind up, and four months later I moved into a flat in Shoreditch. It was then that the contact with my children stopped. Sophie was angry and bitter – she saw my business as the cause of our problems and she resented the fact that I hadn’t given it up – and at one point she didn’t let me see our sons for nearly two months. She admitted recently she did it to punish me. In September I went to the family courts: I wanted to see my children more often and have proper legal access. I never chose to be divorced from them. To my shock I was treated like a criminal. When I told the judge I loved my kids, he described by attitude as “not very healthy”. It was one of many prejudiced comments directs at fathers stating their case for contact. I discovered I had “no legal presumption to contact” and was told that I should be “grateful” for whatever I got. At the first hearing, I was given 80 hours a month. I appealed and my access was reduced to eight hours a month. In court Sophie made it clear she wasn’t happy about me seeing the children; she said they found it too upsetting. Consequently, the judge kept reducing the hours. I felt so angry, as if I had suffered a living bereavement. I’m a hard-working, loving father with a decent flat and a good job, but no one in the legal system was on my side. I spent more than £10,000, out of my own pocket, going through the courts. 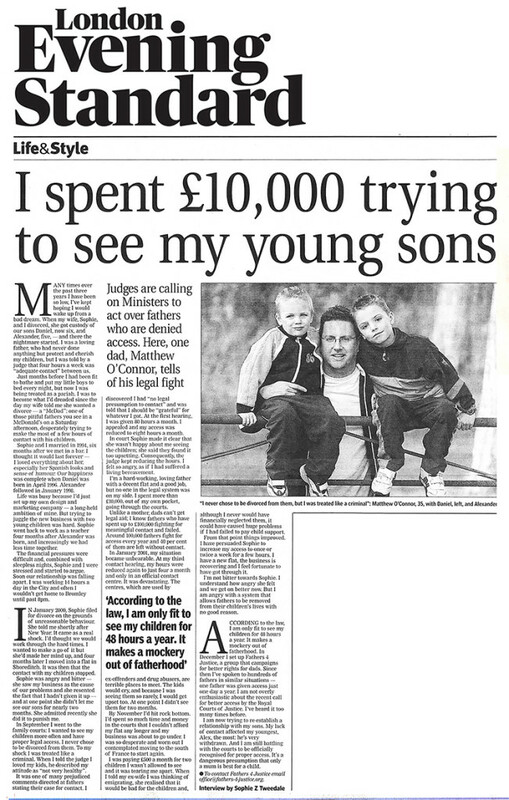 Unlike a mother, dads can’t get legal aid; I know fathers who have spent up to £100,000 fighting for meaningful contact and failed. Around 100,000 fathers fight for access every year and 40 per cent of them are left without contact. In January 2001, my situation became unbearable. At my third contact hearing, my hours were reduced again to just four a month and only in an official contact centre. It was devastating. The centres, which are used by ex-offenders and drug abusers, are terrible places to meet. The kids would cry, and because I was seeing them so rarely, I would get upset too. At one point I didn’t see them for two months. By November I’d hit rock bottom. I’d spent so much time and money in the courts that I couldn’t afford my flat any longer and my business was about to go under. I was so desperate and worn out I contemplated to moving to the south of France to start again. I was paying £500 a month for two children I wasn’t allowed to see and it was tearing me apart. When I told my ex-wife I was thinking of emigrating, she realised that it would be bad for the children and, although I never would have financially neglected them, it could have caused huge problems if I had failed to pay child support. From that point things improved. I have persuaded Sophie to increase my access to once or twice a week for a few hours. I have a new flat, the business is recovering and I feel fortunate to have got through it. I’m not bitter towards Sophie. I understand how angry she felt and we get on better now. But I am angry with a system that allows fathers to be removed from their children’s lives with no good reason. According to the law, I am only fit to see my children for 48 hours a year. It makes a mockery out of fatherhood. 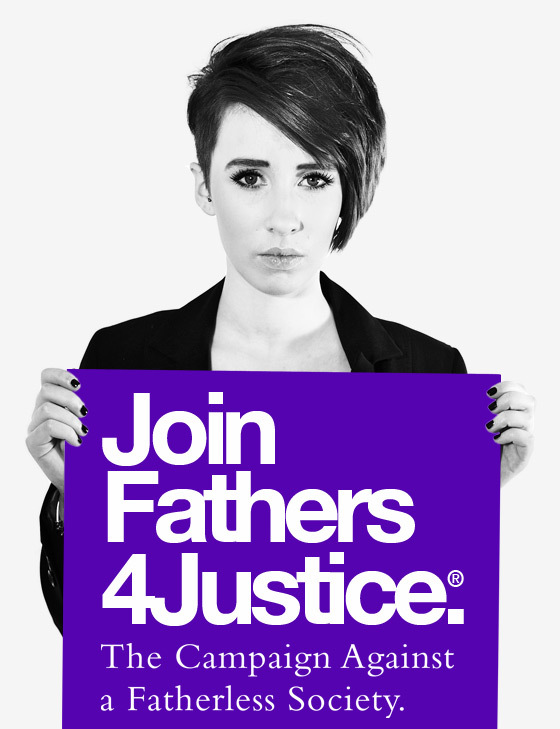 In December I set up Fathers4Justice, a group that campaigns for better rights for dads. Since then I’ve spoken to hundreds of fathers in similar situations – one father was given access just one day a year. I am not overly enthusiastic about the recent call for better access by the Royal Courts of Justice. I’ve heard it too many times before.